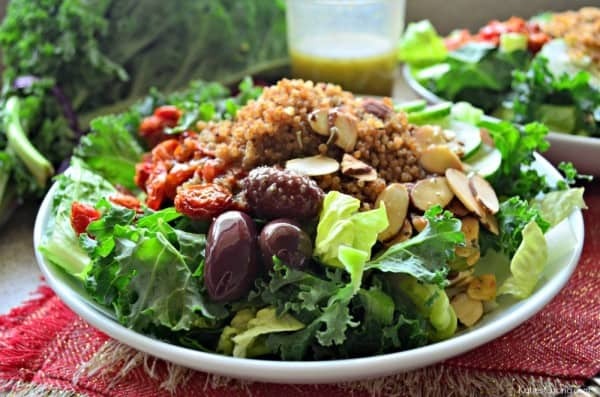 Enjoy this Panera Bread copycat recipe of Mediterranean Quinoa Salad with Sliced Almonds at home! I’m so excited about this Mediterranean Quinoa Salad with Sliced Almonds that I’m sharing today. On busy days when we’ve been running around doing errands in the morning I find myself running through the drive through. The thing is — I don’t like typical fast food. Lucky for me, I have a Panera Bread that has a drive through in my neighborhood! So I find myself running through the Panera drive through more days than none. But it get’s expensive to eat out often, and since I’m constantly trying to watch what I’m spending I decided to try and make the new Mediterranean Quinoa Salad with Sliced Almonds at home. Let me tell you–it’s pretty darn close to what you get at the restaurant. And even better you can make 4 servings for the price of that one salad you get in the store. I first started by roasting grape tomatoes. This is best to be done the morning that you want to eat the salad or the day before. It’s a slow process and they roast for a few hours on 200-250 degrees Fahrenheit for a good 2-3 hours. It seems like a long time but your cooking these low and slow. I make these often during tomato season. They are sooo good. Next up, make the homemade Greek Salad Dressing. This recipe makes a little less than 1 cup which is great for small batch salads and should be plenty of dressing between the 4 salads. You’ll also want to cook your quinoa too. Then, once you’ve done all the prep work it’s time to assemble the salad. This salad is so good and tastes so much like the new Panera salad yet cost a fraction of the price which makes me happy! This is a great salad to enjoy for lunch or dinner or even serve as a starter salad before dinner. 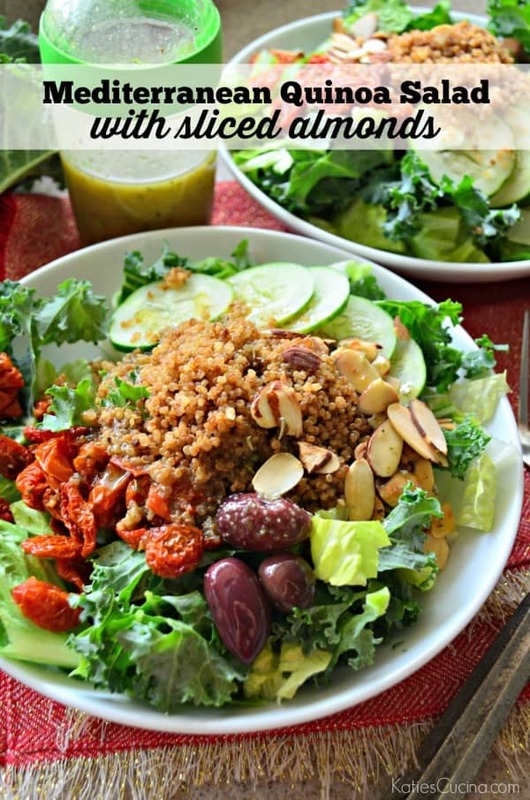 Regardless of the way you serve this salad I invite you to make my copycat recipe for Mediterranean Quinoa Salad with Sliced Almonds. 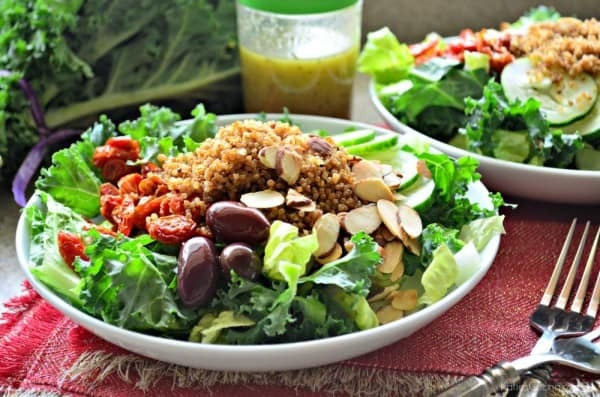 In 4 bowls, begin to arrange the salad by mixing 1/2 cup each chopped romaine and kale. To each plate add: 3 kalamata olives, 2 tablespoons of oven roasted grape tomatoes, 4 cucumber slices, 1/4 cup cooked quinoa and 1 tablespoon toasted sliced almonds. 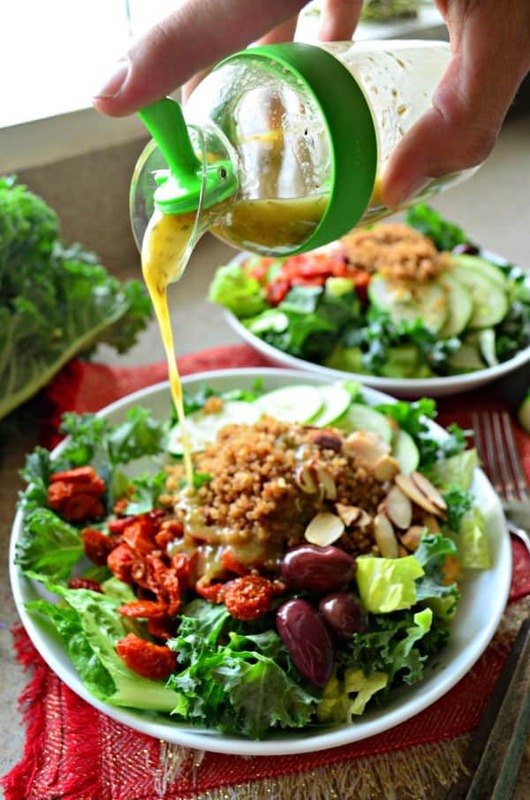 Serve immediately and top with Greek Salad Dressing. Thank you so much for this recipe! This salad at Panera is my favorite but I really don’t like paying $9 for it. I was tempted to skip the tomatoes and buy sundried instead but I’m so glad I didn’t! They were the best part of the salad. Hi Lisa! Yessss! So glad you enjoyed this salad. I agree–the tomatoes are the best part and so versatile.